Kampala — The Supreme Court was yesterday asked to annul the constitutional amendment law that removed the 75-year presidential age limit clause that paved way for life presidency in Uganda and allowed President Museveni to contest in the next general elections in 2021 when he will be aged 76. The call was made by lawyers representing three appellants as they presented a summary of their written submissions to the highest court in the land. The appellants are; Uganda Law Society (ULS), six opposition MPs and city lawyer Mr Male Mabirizi Kiwanuka. The Attorney General is the respondent. "Judges of the lower court recognised violations of the Constitution but offered no remedy. A remedy must flow from a wrong otherwise there is no reason to petition court. The wrongs were clearly intended to achieve a particular result," argued counsel Wandera Ogalo for the Uganda Law Society. "That result is what the remedy has to target -- Constitutional Amendment Act 2018. Its nullification is the logical result of the violations of the Constitution," he added. Mr Ogalo further argued that the invasion of Parliament by the army was calculated to intimidate the MPs who were opposed to the amendment and later achieve the said enactment of the presidential age limit law. The appellants collectively argued that the unlawful invasion of Parliament by soldiers made the lawmakers debate the age limit Bill under 'fear' and 'duress' and that this kind of environment amounted to treason since the Constitution was amended by force. Mr Ogalo appealed to the seven justices of the Supreme Court led by Chief Justice Bart Katureebe to annul the constitutional amendment Act 2018 and send a clear message out that you can't achieve something by breaching the Constitution. The other justices are: Stella Arach-Amoko, Eldad Mwangusya, Rubby Opio Aweri, Prof. Lillian Tibatemwa-Ekirikubinza, Paul Mugamba and Jotham Tumwesigye. Mr Mabirizi who was the first appellant to highlight his submissions, urged the justices to be highly sober and strong in answering the appeal and that their failure will be disastrous for the country. "It is my opinion that the Uganda Judiciary has been responsible for all Uganda's political deaths and instability, economic collapse and erosion of our social fabric since 1966 because of its consistent failure to render fair judgments on political contests brought before it, which promoted bad politics that destroyed our economy and social fabric," Mr Mabirizi told the justices. He added: "My lords, since your judicial power is derived from the people, you have a duty to protect yourselves, children, grandchildren, relatives, in-laws and the country as a whole from the grave consequences of collapse of rule of law which are like a hailstorm which indiscriminately ravages homesteads." Mr Mabirizi hit out at majority of justices of the Constitutional Court for upholding the removal of the presidential age limit clause from the Constitution. "If the Mbale session was a football match, it was clear that the Justices-referees-- were supporting my opposite team and on realising that I was destined to win, the head-referee in the DCJ (Alfonse Owiny-Dollo), turned into my opponents' second goalkeeper, and while in the goal-box, cancelled any goal I scored before issuing me a yellow card for protesting his actions. Kampala Lord Mayor, Erias Lukwago who represented six opposition MPs, submitted that the amendment of the Constitution to deal away with the only remaining safety-nut to prevent life presidency went against the preamble of the 1995 Constitution. He explained that the framers of the 1995 Constitution had it in mind about Uganda's dark past and that's why they included in their preamble 'never again' should any actions be done to plunge the country into its ugly past. Mr Lukwago also faulted Speaker of Parliament Rebecca Kadaga, accusing her of amending the order paper to include the age limit Bill and yet she doesn't have such powers to do so. He explained that the Speaker has the powers to alter the programme on the order paper but not to amend it and introduce new items. Today, the Attorney General, Mr William Byaruhanga and his team, are expected to defend the Constitutional Court judgment that upheld the passing of the Constitutional Amendment Act 2018. 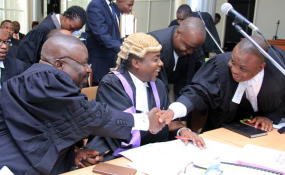 On July 26 last year, the Constitutional Court sitting in Mbale District, in a 4:1 majority decision upheld the scrapping of the presidential age limit clause from the Constitution by Parliament.